Mirjam Keochakian ’19 runs to high-five her teammates during their game against Clark University on Saturday afternoon. With three goals from Keochakian, they defeated the Cougers 6-1, securing MHC’s 13th victory. 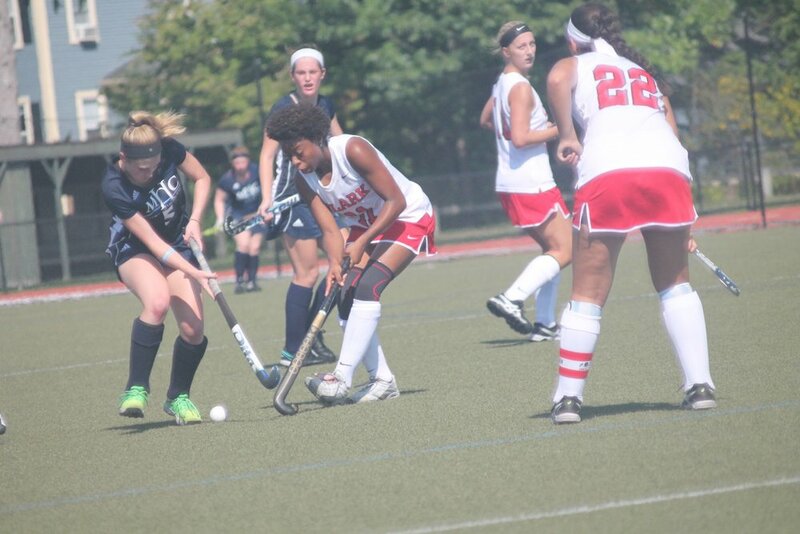 At their first New England Women’s and Men’s Athletic Conference (NEWMAC) game, the Mount Holyoke field hockey team beat the Clark University Cougars in a landslide win of 6-1 on Saturday, Sept. 16. The last time the team played Clark, a year ago, MHC won 5-1. Clark University maintained a strong defense for the first quarter of this game, but ultimately ended up down a point after Kathryn Rawson ’18 passed the ball across field to Sophie Perekslis ’18, who scored the first goal of the game. The remaining portion of the first half saw an impressive mid-air-save by the Clark defense and collective groans from Mount Holyoke fans as the team narrowly missed various corner shots. Withjust two and a half minutes left on the clock, Kaitlin Braz ’18 broke through Cougar defense, ending the first half with a 2-point lead. Within five minutes of the first half Mirjam Keochakian ’19, assisted by Newsham, scored a point to the thunderous support of fans. With the crowd still celebrating the last goal, the team’s unwavering focus allowed Keochakian to make yet another successful shot. The Cougars scored their first and only goal at 56:35 after Mount Holyoke keeper Maddie Miller ’21 blocked a shot, but sent the ball careening out to junior forward Olivia Barksdale who took the opportunity and scored for Clark. Keochakian, in top form, scored another goal during the game’s first stroke, a goalie penalty that, according to team manager Emet Marwell ’18, typically happens about “once every seven games.” This game had two. Afteran unsuccessful shot by Clark’s offense, and with minutes left on the clock, Anna Ballou ’20 drove the ball all the way down the field, but was tripped by the Clark goalie before she could make her shot. Newsham took the penalty stroke, resulting in the sixth and final goal of the game. The win marks the team’s 12th victory in the past 13 games, having lost against Williams College last Wednesday evening. The game served as an important confidence booster after the loss, as well as strong start to NEWMAC play. “In the end, conference game victories will get us to playoffs, so I think we all knew the importance of the game coming in. We needed to score early and often to secure that win, and I think we did just that,” said Keochakian. The Clark University Cougars battle against Mount Holyoke on the field. The Mount Holyoke team’s strong offense helped them win on Saturday.